Russia’s invasion of Ukraine’s Crimea last week has shocked Westerners who find this military intimidation of a smaller neighbor all very reprehensible. “You just don’t in the twenty-first century behave in nineteenth-century fashion by invading another country on completely trumped up pretext,” thundered America’s secretary of state, John Kerry. Others, outside government, have been all the more forceful in their vilification of Russia. To properly understand Russia’s moves in the Crimea, one has to go back further than the recent Ukrainian crisis — in which Russia successfully persuaded Ukraine to abandon trade talks with the European Union and support his dreams of an Eurasian Empire instead — to the end of the Cold War. 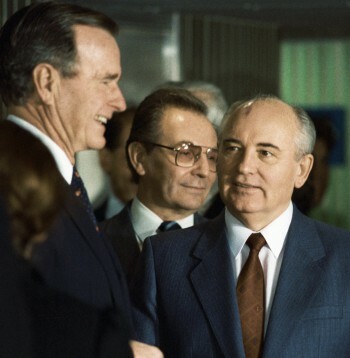 In February 1990, after the collapse of the Berlin Wall and shortly before the Soviet Union would collapse, American president George H. W. Bush promised his Soviet counterpart, Mikhail Gorbachev, that NATO would not take advantage of his moment of weakness in his country’s history and expand eastward. The Russians believed they had reached an understanding with the United States that, as the Cold War was ending, they would enter a partnership with the West and together be responsible for security in Europe (cf. : Michael R. Gordon, “The Anatomy of a Misunderstanding“, The New York Times, 25.05.1997). That partnership quickly fell apart. In 1999, the Czech Republic, Hungary and Poland joined NATO. That same year, the alliance bombed Serbia, a Russian client state, without coordinating with the Russians. In 2004, the remaining Warsaw Pact countries entered NATO and even three former Soviet republics: Estonia, Latvia and Lithuania. They joined the European Union that same year with Bulgaria and Romania following three years later. It was also made clear to Russia that it would never join NATO itself. Instead, in 2006, the alliance announced plans to a erect a missile shield in Central Europe with stations in the Czech Republic and Poland. While supposedly aimed at Iran, the Russians saw the system as undermining their nuclear deterrent. Plans to also establish radar stations in Azerbaijan, Georgia and Ukraine did little to placate their concerns, nor did the Bush Administration’s clear hope of drawing Georgia into NATO as well. That explains in part why Russia reacted so aggressively when, in 2008, Georgia tried to reassert control in its breakaway regions of Abkhazia and South Ossetia. Russia invaded, occupied both provinces and recognized them as independent states. NATO’s advance into the Caucasus now appears to have been halted. In Europe, with NATO virtually on Russia’s doorstep, the only remaining buffer states are Belarus, which is ruled by a Russian puppet, and Ukraine, which, as the Russians see it, the West just tried to snitch from them. They felt there had been a bait and switch. I said at the time we would pay hell ever getting them to cooperate in the future. — Robert Gates quoted in Peter Baker, “U.S.-Russian Ties Still Fall Short of ‘Reset’ Goal“, The New York Times, 02.09.2013. Indeed, the United States would. Russia subsequently blocked any attempt in the Security Council to condemn the regime of Russia’s Syrian ally, Bashar al-Assad. While this Russian intransigence might actually have been useful for President Barack Obama to hide behind, given his own reluctance to intervene in the Syrian conflict, it has nevertheless been derided by American officials with Obama’s then-ambassador to the United Nations, Susan Rice, who is currently his national security advisor, publicly venting her “disgust” at Russia’s repeated vetoes. Russia has come to increasingly see Western denunciations of its foreign policy as little more than hypocrisy. At the same time, Vladimir Putin is presiding over something of a nationalist revival in which anti-Americanism plays a prominent part. The Russian leader has revived Soviet-style military parades and a labor medal that was introduced by Joseph Stalin. He is also increasing the flying of the Russian tricolor and ties between the Kremlin and the Russian Orthodox Church have grown closer. This seems an attempt to shore up Putin’s working class support. 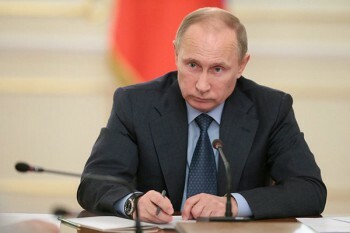 Urban and middle class Russians, whose economic prospects improved during the last decade in large part because of the liberal reforms Putin initially enacted, are growing dissatisfied with the still rampant corruption and Putin’s authoritarian tendencies. Rural and working class voters, by contrast, have seen little economic improvement in recent years and are turning to communist and nationalist rather than leftist opposition parties. Putin’s appeals to Russian patriotism and tradition, including the infamous ban on gay “propaganda,” seem designed to charm those constituencies. Portraying a “strongman” image has been Putin’s forte and it is something many Russians respect. That is not to say the invasion of the Crimea is designed to make Putin look strong and the West weak. But it does seem many Russians believe it is about time their country took a stand against Western “imperialism” and Ukraine, which even many liberal Russians consider an extension of Russia proper, is the perfect place for it. The Crimea, which was part of the Russian Empire for almost two centuries before Soviet leader Nikita Khrushchev transferred it to Ukraine in 1954, has a largely Russian population and been portrayed in Russian state media as the victim of the new regime in Kiev — which, they emphasize, is being backed by Ukrainian fascists. If the West could invoke a “responsibility to protect” civilians in Libya and bomb Serbia so Kosovo could have its self-determination, surely Russia is justified doing the same in the Crimea where its troops have been welcomed by the local population? Steven Pifer, “Did NATO Promise Not to Enlarge? Gorbachev Says ‘No’“, Brookings, 06.11.2014. Mark Kramer, “The Myth of a No-NATO-Enlargement Pledge to Russia“, The Washington Quarterly 32, no. 2 (April 2009): 39–61. This entry was posted in English, Nick Ottens, Russia, Ukraine.